This is most unlikely to be a photograph of the RAAF SE5a A2-24 that crashed during the opening of Parliament House on 9 May 1927. 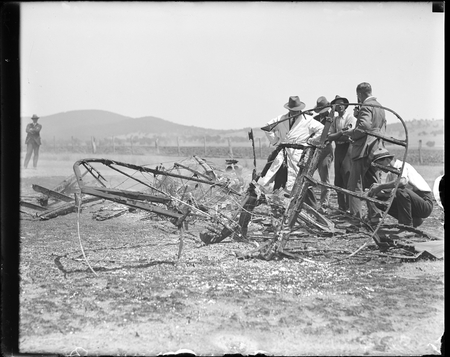 A photograph of the wreckage in the Canberra Times on 13 May 1927 shows an unburnt aircraft. This is almost certainly the remains of a 3 Squadron RAAF DH9 A6-28 that crashed and burned at Canberra on 11 February 1926 killing both crew, Flg Off P.M. Pitt and AC1 W.E. Callander. Absolutely not the crash in front of Parliament House, not with that fence running through the photograph. Time to change the caption, MOAD!